His heavy itchy feet syndrom, his taste in a wide range of styles in Psychedelic Trance and the lust for encountering new like minded psychonauts has led him to perform at events such as Antaris Project (Germany), Hilltop New Years Eve (Goa/India), Momento Demento Festival (Croatia), Kosmos Festival (Finland), Universal Religion (Nepal), Trimurti Festival (Russia), Waldfrieden Wonderland Festival (Germany), Yaga Gathering (Lithuania) and countless other events around Austria, Cambodia, Costa Rica, Croatia, Czech Republic, Finland, France, Greece, India, Italy, Lithuania, Malaysia, Nepal, Russia, Slovakia, South Africa, Switzerland, Singapore, Thailand, Turkey and the Netherlands. 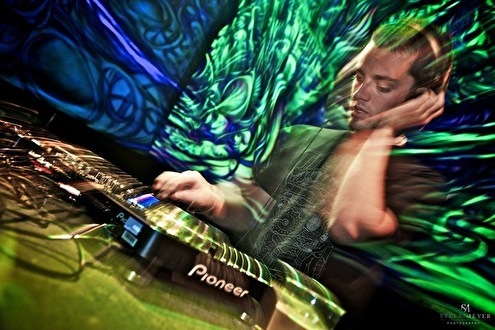 Not being caught in one style or direction, he is constantly trying to discover and fuse different varieties of psychedelic music with the aim of overcoming musical boundaries that had been created in people's minds due to the musical fragmentation happening nowadays in the Psychedelic Trance Movement. Creating a journey sui generis for his listeners is his biggest aspiration. Psychedelic Trance has to be approached from different angles, using the many colourful vibrations it offers. Therefore, sG4rY likes to play sets as long as possible in order to draw from the different musical influences he gets from befriended artists, musicians and freaks around the globe. Nightly journeys that disscolve towards the first glimpses of the new day as well as sending the crowd into the night with a powerful kick off, or even sunny variations with non-cheesy hypnotic daytime trance are all part of his repertoire. He loves that special energy during sunrise and sunset on the dancefloor and tries to use it for involving the crowd into a flow of certain feelings and sensations, sometimes humorous, sometimes gloomy or filled with deep emotions. His numerous various artist releases over the years on different labels mirror this passion for muscial variety and expression. sG4rY furthermore decided together with his Brother-from-anotha-Motha DJ Merry to launch a DJ-project called Brotherys. Since 2010, they play their mixture of of powerful, deep and groovy Night Stuff and lysergical Forest Sounds for dancefloors around the globe and have compiled both Brotherys Balderdash Compilation, released on Purple Hexagon Records. Next to his involvement in the two labels Sangoma Records and Purple Hexagon Records, sG4rY is also an active part of the Gaggalacka Festival, which will celebrate its 15th anniversary in the late summer of 2016.